There is something so beautiful about a big event in horse racing. The colors, the pageantry, the contradiction of the sheer power and force of these 1,200 pound animals running like the wind on those fragile, spindly legs. Which one will show heart? Which horse would rather be somewhere else? So you don’t care for horse racing? Trust me on this one; if you watched ESPN’s wonderful coverage or were lucky enough to be there in California, you know what happened. And if your Saturday did not include a glimpse of the Breeder’s Cup at Santa Anita Park, then you missed history and possibly the most dramatic horse race of all time. The 5-year-old, Zenyatta, became the first filly to win in the 26 years they’ve run the Breeders Classic, obliterating the boys and writing a special chapter in the Sport of Kings. Fortunately, you can see it here or below. This beautiful animal, now undefeated in all of her 14 races and running most likely for the final time, came back from absolutely, dead last. I mean WAY back. But why the horrific start? It could very well have been the loading of the horses at the gates just minutes before. It was one of the strangest, frightening and most chaotic incidents you’ll ever see in racing. The first 11 ponies loaded without much of a problem, though Zanyatta herself was a little reluctant and had to be pushed from the rear. But then the #12 horse, Quality Road, simply decided- he wasn’t going to race- at all. For at least ten minutes, they tried everything to load that horse into the gate. He would have none of it, kicking his rear legs powerfully and dangerously, forcing his handlers to start again over and over. Finally, they decided they’d blind him so they put a hood over his head and led him into the gate. Very bad move. The horse completely freaked out, kicked even harder and cut his hind leg. They had to open the front gate and lead him out of there and because of the injury he was promptly disqualified. First time ever there was that late a scratch in the Breeder’s Cup. Through all this high drama, the other horses stood in their tiny gates, getting claustrophobic, restless, or, in some cases, too relaxed (which you do not want of a race horse when they’re supposed to shoot out of there like a rocket). So they unloaded the horses and tried it all over again. Once more, Zenyatta looked unsettled as they pushed her forcefully into the starting position. The race begins (really- watch this; she’s the #4 horse-green colors) and Zenyatta immediately gets off on the wrong foot (literally- the left foot instead of the right). She runs like she’s out for a Saturday stroll instead of a horse race. Her head turns left. Her head turns right. But there’s a championship jockey astride that baby; Hall of Fame rider, Mike Smith- and he knows what he’s doing. Trevor Denman’s call of the race is nothing short of breath-taking. What horse could ever recover from this far back? What horse could ever make up that much ground with less than half the race to go? 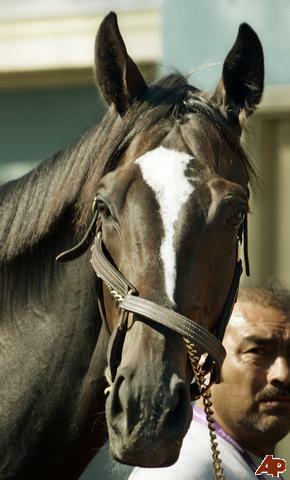 Well, a horse with the biggest heart since Secretariat; Zenyatta, possibly the greatest filly of all time, that’s who. There’s a spirited debate about which thoroughbred will be named Horse of the Year. A lot of experts are enamored with another horse named Rachel Alexandra (first filly to win the Preakness in 85 years back in May). Said jockey, Mike Smith of his magical horse, the incomparable Zenyatta, “She’s sent from God. It’s his filly.” You don’t mess with God’s filly.